regurarly so please remember to bookmark us. Never leave your cooking unattended. Always keep your stove company. Especially if you’re frying something—that’s when things can cross the line in mere seconds. It's one of the simplest fire safety tips, but it's also the leading cause of kitchen fires. Keep it clean. Keep stove and counter surfaces free of clutter, grease, and especially flammable objects like hairspray, bug spray, or air freshener. In case of an emergency you’ll be able to react faster given the freedom of space. Set a timer. Don't just rely on your brain; we're human, and we get distracted. A timer can remind you to switch off the burner or oven, saving your food and possibly your house from being burnt. Covering the pan with a lid or a bigger upturned pan. Spray the pot with a fire extinguisher. If you're an employer, consider a fire extinguisher training for your employees to be able to know the proper use of the device. If you don't have a fire extinguisher handy, douse the burning oil with baking soda. Never run with a pan fire. You run the risk of spreading the fire further when the oil drips. Never throw water on the pan—it will splatter the oil and spread the fire, possibly burning you. Wear tight clothes. Billowing sleeves or hanging accessories above a lit stove can spell disaster. Install a smoke detector in the kitchen. 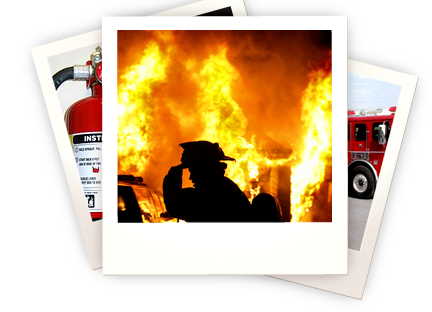 In a commercial enviroment, consider investing in fire safety training for employees. The proper dryer duct should vent directly outdoors—never to a room inside the house, as the air discharge can contain a combination of combustible gases. Avoid plastic duct work, which is more easily ignited or melted; opt for a hard metal duct (with as few bends as possible) from the dryer to the exterior of your home. You'll breathe more easily when you load your laundry. Keep the duct free of lint to help reduce the chance of fire spreading from the dryer to the vent. Clean the lint trap after every use. A professional should also help you periodically dismantle the dryer to clean between the dryer drum and the heat element. Install a smoke detector nearby. Never leave fire unattended. Candles may be small, and the flames they produce may be even smaller, but it takes just a few breaths for an upturned candle to create an inferno. Use a smart surface. Always place candles on a non-flammable surface, and keep them away from paper, curtains, and other items that could be easily ignited. Use a screen in front of the hearth—make sure it's large and heavy enough to encompass the entire opening and to stop any stray logs from rolling out of the fireplace. Perform regular check-ups. Chimneys and woodstoves require annual (and thorough!) cleaning, and monthly inspection in case of obstructions or damage. Never burn paper, trash, or green wood; apart from being highly flammable, scraps of burning paper or trash may actually drift up through the chimney or pipe and land on—and light up—your roof. Extinguish the fire once you want to move away from it and cool the ashes. Ensure that the ashes are then harmlessly sealed away in a metal container outside the home. Be a smart shopper. Buy electrical products evaluated by the nationally recognized laboratory (i.e. UL). Be sure to check the label as products often contain their own set of fire safety tips and warnings. Replace all frayed wires: worn, old, or damaged appliance cords belong in the dumpster and not shoved under the rug. Use three-prong plugs in three-slot outlets, and two-slot plug into two-slot outlets. Make sure your kids know this, too. Portable space heaters heaters must be kept four feet or more away from combustible surfaces and objects. Ensure that your heater has a thermostat control mechanism (so it automatically switches off if it falls over!). Never overheat it, and always use it in a well-ventilated room. If it's a kerosene heater, clear K-1 kerosene should be the only thing you're feeding it. Invest in a few smoke detectors if you haven't already. As the only household item that's on the alert 24/7 against the threat of a fire, smoke detectors save lives every day—and they could save yours. Never disable a smoke alarm, including when you're cooking. Open a window, wave a dishtowel to clear the air, and let it blast its warning that you might have just overcooked your meal. Audible alarms are available for the visually impaired (the sound of the alarm shouldn't be a monotone; a small pause of silence helps this person hear voices or other critical sounds in the surrounding environment). Install an automatic fire sprinkler indoors. Keep the indoors a no-smoking zone. If you must smoke, smoke outdoors; too many home fires begin inside the home, with smoking materials as the catalyst. Be alert. Don't snooze and smoke. If you're feeling the slightest bit drowsy (due to sleep deprivation, medication, alcohol, or any other reason), put out your fire immediately. Snuff them out. Extinguish the cigarette in a sand-filled can, or drown cigarette butts and ashes in water. Never throw away hot cigarette butts or ashes without attending to them properly. Never smoke where oxygen is being used; for instance, a family member might be using home oxygen therapy, but even if the oxygen is turned off, the building is much more vulnerable. Oxygen can be explosive and will only serve to fan the flames. Draw up an escape plan. This is a critical proactive step; it's easier to follow up on something we've visualized and practiced before, particularly when we need to repeat it during a chaotic emergency. Plan at least two escape routes; from every room—particularly the bedrooms, where you're most likely to be caught unaware, relaxed, and/or asleep. Purchase fire ladders; for the upper stories: ensure that these ladders are collapsible and have been evaluated by a nationally recognized laboratory (i.e. UL). Check windows; to make sure that the glass isn't stuck and that screens can be swiftly removed. Discuss the escape routes with your family; every single member of the household should know the basic safety procedures: Stop, Drop, and Roll; bring home those school fire-drill mantras. Practice; can you feel your way out of the house with your eyes closed, or in the dark? Do you know the quickest way to crawl out? Do you know the low windows from which you could jump? Do you instinctively use the back of your hand to feel a door's heat, and do you remain crouched down as close to the floor as possible?